Thousands of people rallied in central Taiwan on Sunday, marking the third straight weekend of protests calling for the Taiwan leader Chen Shui-bian to resign over scandals involving his family and senior aides. The demonstration in the city of Changhua, roughly 150 km (90 miles) south of Taipei. Chen's public approval ratings have sunk to all-time lows amid pressure from the opposition. Holding placards, honking air horns and waving flags, the crowd on Sunday chanted slogans for Chen to quit. 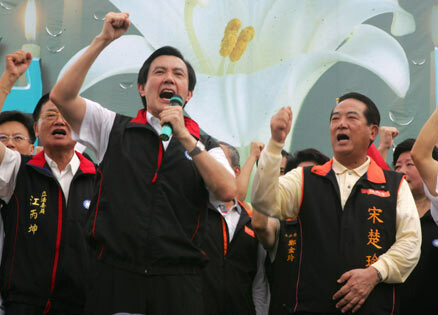 Members of the main opposition Nationalist Party kicked balls to knock down drawings of Chen's family members, including wife Wu Shu-chen and son-in-law Chao Chien-ming. Wu has been accused of accepting millions of Taiwan dollars of department store gift vouchers. Chao has been detained since late May on suspicion of insider trading, and prosecutors last week rejected his lawyers' second appeal for bail. Chao and Wu have denied any wrongdoing. Arguing that Chen is not fit to rule, the Nationalists and their allies launched a recall motion in "parliament" last week which would authorise a referendum on whether or not Chen should remain in office. According to law in Taiwan, Tuesday will be the last day for Chen to respond to the motion.